Welcome to the very first edition of a fun, new little monthly series we are calling "Season Ticket Holder Stories." Among Season Ticket holders, and those frequent to Ogren Park Allegiance Field for Osprey games, you hear the word "family" is thrown around very often. From seat neighbors and aisle buddies, to relationships built with the Front Office and Day of Game staff - there is an undoubtable feeling of camaraderie, support and family. The Kulaskis are no exception. Meet Gary, Dawna and Deklan. Gary, a self-admitted Dodgers fan (we cut him some slack) and die-hard baseball fan, spent the early years of his relationship with Dawna "turning her into a baseball fan." Fast forward to the present, Gary's mission was successful - Dawna is all in! So - for the couple it was all but a formality for them to raise their son Deklan, to love the game as well. For years the family would capitalize on Gary's perks at work, bringing out the family with the corporate season tickets. 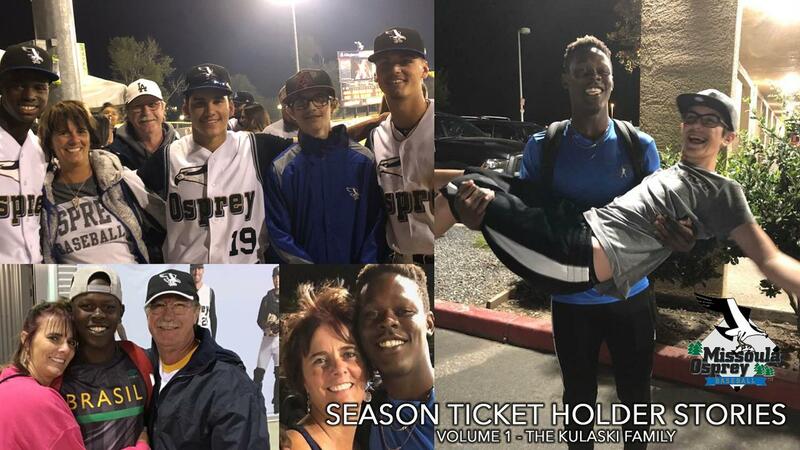 In 2016, the Kulaskis became full-fledged, Osprey Season Ticket holders, and an unexpected addition to their family changed their relationship with Osprey baseball forever. Bahamian short-stop and 18-year-old, Jasrado Chisholm, was entering his first season in the Diamondbacks organization as a relative unknown prospect. At 18, and having no real rental history, Jazz was having trouble finding a place to live for the season. Enter the Kulaskis - after hearing of Chisholm's struggle, they opened their home to him without a second thought. Jazz tore through the 2016 season and was named a 2016 Mid-Season All-Star while sky rocketing up the D-backs organizational prospect ranks - but accolades were not all he collected that season. Chisholm collected a second family - a mother to feed and support him, a father to hound him on the fundamentals of the game, and brother to play video games through the night. "I mean, they mean everything to me. I love them so much and I still visit them every off season...so I mean, that says it all" said Jazz when asked about his relationship with the Kulaskis. "I can't wait to see them in January," he added. 2018, the Kulaski family grew by 3. "We received a call from Arizona about three top prospects who would certainly be in need of housing, I immediately knew who to call," said Director of Operations Taylor Rush. Unselfishly, the family moved Deklan to the basement (we won't mention the 70" TV down there), and made room for OF Alek Thomas (18), SS Blaze Alexander (18) and OF Kristian Robinson (18). "The Kulaskis greeted us three with open arms and they did their best job to make it feel like home for us," said Alek Thomas. "It meant a lot for them to go out of their way during our time there, and I couldn't appreciate what they did for us anymore." The Kulaskis, now a family of 7, can be seen throughout the park at every Osprey game. Deklan, frequently using the family's 4th ticket to bring a friend, is often seen bouncing across both sides of the concourse, collecting rubber ducks from the Fun Zone and participating in between-inning promotions. You can usually spot Gary by his blue Dodgers cap, visiting the 3rd base concessions for a refreshment or on the concourse between sections 101 & 103, talking baseball and prospects with members of the Front Office. If you sit in section 101 very often, you will undoubtedly get to know Dawna, taking in every pitch and routing on her boys. Come 2019, keep your eye out for Gary, Dawna and Deklan around the stadium - and stay tuned for the next edition of Season Ticket Holder Stories.